Powerful storms tore through the D.C. area Wednesday evening, flooding roads, damaging buildings and uprooting huge trees. Further south, four people -- including a 2-year-old boy -- were killed in Virginia. Nine tornadoes were reported in the state in which Gov. Terry McAuliffe declared a state of emergency. On Thursday the governor toured the hardest-hit areas by helicopter and on the ground. He said there is "tremendous devastation" in the state, and homes flattened for miles. "It's really sad to be there and see families and friends walking through the debris and all you have is a cement foundation, and they're just walking through, trying to find a memento," McAuliffe said. In the D.C. area, thousands of people were without power Wednesday and cleaning up damage Thursday. The Baltimore-Washington Parkway was closed in both directions during rush hour Thursday morning because water completely covered the roadway. 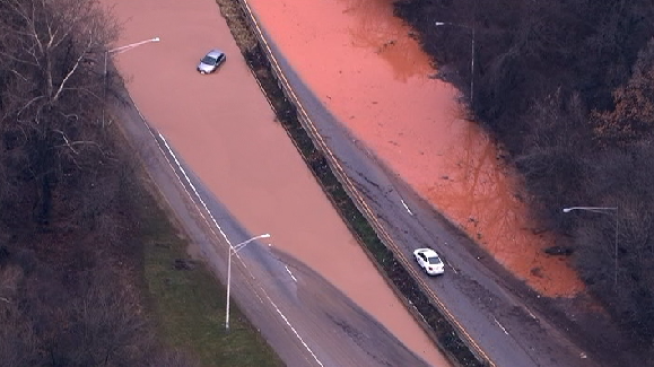 Chopper4 flew over the scene, capturing images of a car stranded. A Silver Spring, Maryland, man in his 80s was trapped in his basement after water seeped inside and then caused a cinder block wall to collapse. An EMS crew rescued him from beneath the rubble. A tenant of the man pleaded for help in a panicked 911 call. "I was upstairs. I heard a tremendous crash," she said. "The wall fell. He's sitting in cinder blocks. Some are on him. He can't get up." The man is expected to be OK and was staying with family, News4 learned. Members of a church in Germantown, Maryland, were getting ready for Wednesday evening Bible study and choir practice when the storm hit. "We heard a tremendous loud sound," Rev. Dennis Felder of Upper Seneca Baptist Church said. The church's roof was damaged amid high winds that snapped and uprooted trees. But the congregation was safe. "We were definitely in God's hands, being protected," the reverend said. Many people needed to be rescued after their cars got stuck in high water. One man was left with a couple inches of water covering the floorboard of his Dodge Challenger after he drove into high water at Eastern and Minnesota avenues NE in D.C. He thought he could make it but was mistaken. "My engine just literally shut off," he said. While much of the flooding has receded, flooding did close White's Ferry on Thursday. Wednesday evening, many parts of Virginia were under tornado, thunderstorm and flood warnings and watches. One funnel cloud was seen about a half-mile north of the Stafford County Government building, Storm Team4 reported. The parking garage of the Franconia-Springfield Metro station was flooded Wednesday evening, with water reaching curbs. Metro officials opened the gates so drivers could leave more easily, and maintenance crews were on hand. Major flight delays were reported at all three of the region's major airports. Incoming flights at Reagan Washington National Airport were delayed by more than an hour on average. Multiple flights at Baltimore/Washington International Thurgood Marshall Airport and Dulles International Airport were delayed or canceled.